Woot! has the Samsung 29″ Curved Monitor, that can normally be found online for (around) $600 for just $249. WFHD: A step up from Full HD, WFHD’s advanced 2560 x 1080 resolution provides a wider resolution so you can view content on a broader scale. Wide Viewing Angle: Delivers a 178 degrees wide viewing angle horizontally and vertically for optimal viewing experience from any angle. Connectivity: Access a full range of connectivity options with 2 HDMI ports, 1 display port, and 4 USB 3.0 ports. **This deal ends July 2nd or until sold out. 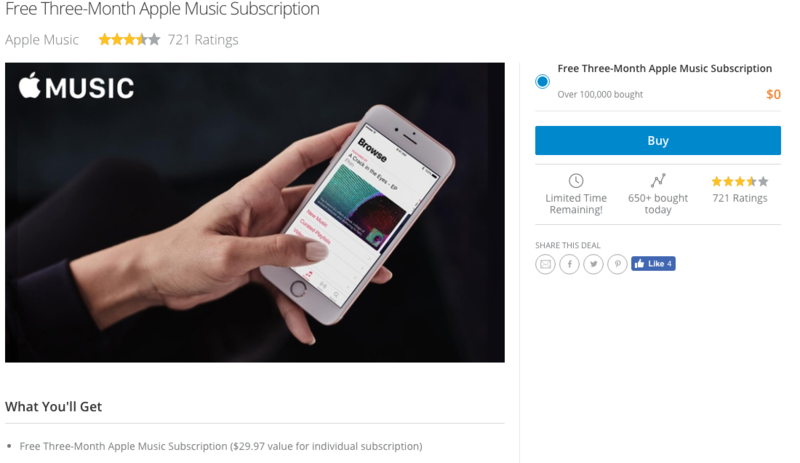 From Livingsocial, we have a free 3 month subscription to Apple Music. With Apple Music you get to listen to a selection of over 40 million songs, on or offline, with zero ad interruption. This offer is for new members, to try it free with no commitment for 3 months. The fine print (and of course there is fine print), is that after the 3-month promotional period, Plans will automatically renew to $9.99 a month for Individual memberships, $14.99 for Family memberships and $4.99 for Student memberships, unless you cancel the subscription with Apple. From Amazon, for those of you with Amazon Prime Memberships, who would like to try out the music unlimited feature, Amazon is offering 4 months of music unlimited for $0.99. With Amazon Music Unlimited, you get access to millions of songs that include new releases from today’s most popular artists, as well as classic music. Amazon Music Unlimited lets you listed ad-free with unlimited skips. The service also allows you to download music for offline listening. **This deal ends July 11th. Tagged with: 29" Samsung Curved Monitor, 4th of July Deals, Amazon, Amazon Music Unlimited, Apple, Apple Music, Deals, Hot Deals, Sales, Samsung, Woot!